Join us for Papyrus: The Art of Paper. Paper has been used throughout history in the creation of artwork. Papyrus showcases artwork made out of paper in several different ways. Featuring artists Alaina Lyle, Marisa Ginger Tontaveetong, Jasmine Williams, Riley Mayhem, Robert Thompson, and Tracie Joyner. Opening reception on April 5th from 6 – 8 pm. Light refreshments will be served. Don’t miss this chance to meet the artists. Hosted by West Georgia Technical College. On view Monday- Friday until April 25th, 9 am – 5 pm. Free and open to the public. Consider booking a gallery tour for your field trip or group outing. Email [email protected] for more info. 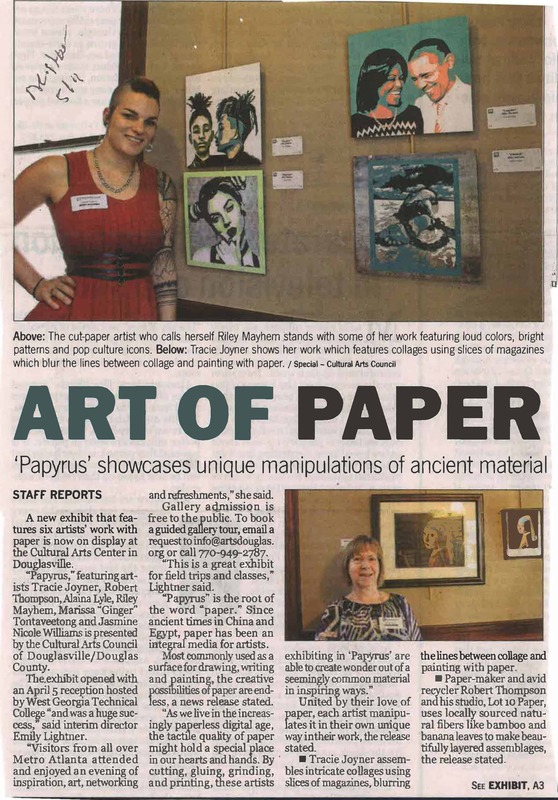 Douglasville, Georgia – The Cultural Arts Council Douglasville/ Douglas County presents Papyrus, a new exhibit in April that features artwork with paper from artists Tracie Joyner, Robert Thompson, Alaina Lyle, Riley Mayhem, Marissa “Ginger” Tontaveetong, and Jasmine Nicole Williams. The opening reception was held on April 5th hosted by West Georgia Technical College and was a huge success. Visitors from all over Metro Atlanta attend and enjoyed an evening of inspiration, art, networking and refreshments. Gallery admission is free to the public. This is a great exhibit for field trips and classes. To book a guided gallery tour, email a request to [email protected] or call 770-949-2787. United by their love of paper, each artist manipulates it in their own unique way in their work. Tracie Joyner assembles intricate collages using slices of magazines, blurring the lines between collage and painting with paper. A paper-maker and avid recycler, Robert Thompson and his studio, Lot 10 Paper, uses locally sourced natural fibers like bamboo and banana leaves to make beautifully layered assemblages. Alaina Lyle says she finds “calm in the process of detail” as she patiently cuts delicate patterns inspired by nature into neutral-colored paper. Her process could resemble a visual meditation on positive and negative space. As a cut-paper artist, Riley Mayhem’s process might also resemble Lyle’s, but Mayhem’s artwork celebrates loud colors, bright patterns and pop culture icons. She creates graphic pop art portraits with a punk rock aesthetic using several layers of colored paper. Jasmine Nicole Williams creates striking imagery with her handmade block prints by blending elements of the famous German Expressionist printmakers and Afrofuturism. A stop motion animated short film by Marissa Tontaveetong will be showing at the opening. Tontaveetong was raised in a Thai-Chinese family. Her film, Have You Eaten?, explores the significance of food in Asian culture using sets and characters constructed out of paper. A paper dim-sum feast from the film, complete with fish and dumplings, is also on display in the gallery. “Papyrus” is the root of the word “paper”. 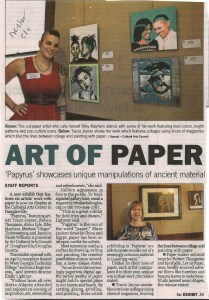 Since ancient China and Egypt, paper has been an integral media for artists throughout history. Most commonly used as a surface for drawing, writing and painting, the creative possibilities of paper are endless. As we live in the increasingly paperless digital age, the tactile quality of paper might hold a special place in our hearts and hands. By cutting, gluing, grinding, and printing, these artists exhibiting in Papyrus are able to create wonder out of a seemingly common material in inspiring ways. The Cultural Arts Council Douglasville/ Douglas County is located in the Cultural Arts Center at 8652 Campbellton Street in historic downtown Douglasville, Georgia. The Cultural Arts Center is open Monday through Friday, 9am to 5pm. For directions and more information, visit www.artsdouglas.org, email [email protected], or call 770.949.2787.